City Manager Phil Kamlarz (foreground) speaks regarding the budget proposal at the Berkeley City Council meeting Tuesday. Amid a grim national, state and local economic recovery forecast, the city of Berkeley will implement drastic cost-saving measures to overcome an overall projected $12.2 million deficit in fiscal year 2012 and $13.3 million deficit in fiscal year 2013. The city expects to balance its biennial budget by eliminating about 79 full-time positions, consolidating public services, increasing parcel taxes and decreasing contributions to pension and health care plans for city employees, as outlined by city Budget Manager Teresa Berkeley-Simmons at the city's biennial budget workshop Tuesday night. The Berkeley City Council is expected to adopt the biennial budget June 28. In attempting to balance the budget, though, city departments will likely absorb the heaviest impacts. The Mental Health Division will shift away from high-intensity services and toward wellness and recovery services while the Public Health Division will decrease clinic and case management services. The Housing and Community Services Department will terminate its weatherization program, convert the West Berkeley Senior Center into a supportive service center and slash funding to community service agencies. Likewise, the Department of Public Works will overcome a projected $2 million to $3 million deficit in its Solid Waste Management Division by deploying 19 one-person solid waste trucks, which will require an initial investment of $1.6 million. "Because Berkeley, like most California cities, continues to struggle towards economic recovery, this biennial budget requires some difficult trade-offs," Berkeley-Simmons said at the meeting. "We face immediate shortfalls, but we need to avoid short-term solutions that do not resolve the long-term problems." However, city employees are not immune to harsh economic pressures. Although the city previously mitigated employee costs by freezing vacant positions, it can no longer rely on such measures, Berkeley-Simmons said. Though 10 percent of city personnel has decreased between fiscal year 2009 and fiscal year 2011 - accounting for over 130 cuts - the city is set to terminate about 79 additional positions through fiscal year 2013. At the meeting, Councilmembers Gordon Wozniak and Kriss Worthington proposed alternative cost-saving measures to job terminations, including salary freezes and decreased payouts, to offset the projected deficit. "It's like the (alternatives) are not even up for discussion," Wozniak said at the meeting. "Is the only alternative really just to get rid of people?" However, Mayor Tom Bates said at the meeting that the city must confront its budget woes even if it requires cutting jobs, adding that "there's no way we can wish or dream our way out of it." 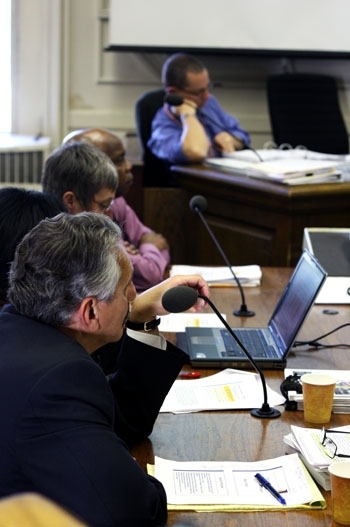 Increasing pension and health care costs contribute largely to the city's budget woes. Rising rates of CalPERS - the city's contribution to the statewide pension agency - will cost the city about $7 million over the next two fiscal years. Health care rates have also risen significantly, increasing about 70 percent since fiscal year 2005. To offset skyrocketing expenditures, the city is also considering several cost-saving alternatives. Potential measures include imposing an annual parcel tax of $52 - which would yield $2.1 million for park, street and clean water programs annually - and requiring property owners to share up to 50 percent of repair costs on sidewalks in front of their properties.